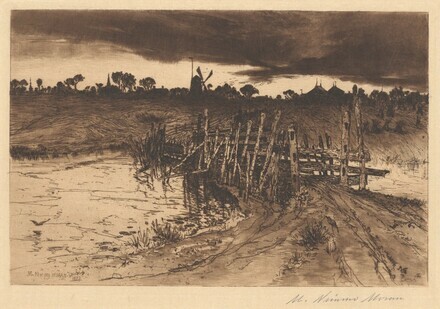 lower left in plate: M. Nimmo Moran 1883; lower right in graphite: M. Nimmo Moran; lower left edge in graphite by unknown hand: Mrs. Thomas Moran; lower center edge in graphite: "Between the gloamin' an the mirk"
An Artist's Artists: Jacob Kainen's Collection from Rembrandt to David Smith, National Gallery of Art, Washington, 2002-2003, as 'Tween the Gloamin' an' the Mirk by Mary Nimmo Moran. Three Centuries of American Prints: from the National Gallery of Art, National Gallery of Art, Washington; National Gallery in Prague, Prague 1; Antiguo Colegio de San Ildefonso, Mexico City; Dallas Museum of Art, Dallas, 2016 - 2017, no. 43. Klackner, Christian. A Catalogue of the Complete Etched Works of Thomas Moran, N.A., and M. Nimmo Moran, S.P.E.. New York: C. Klackner's, 1889, p. 20, no. 29.